this pile is in the extra room – office – tv room – etc. 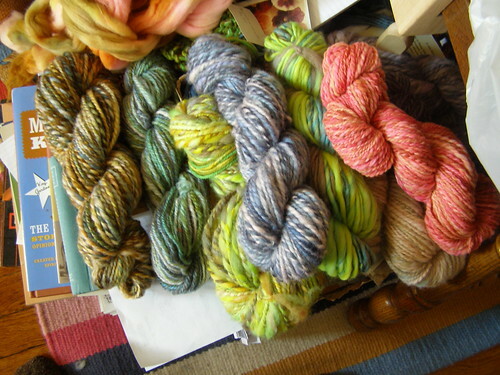 anyhow, that means that today – besides taking photos for tomorrow’s shop update – i need to make the house livable for the non wool obsessed. here are a couple of photos of some of the piles of work i’ve gotten done while ben has been gone. it’s sunny here in pittsburgh. from feeling like 3 degrees with windchill to mid 50s by the end of the week. crazy weather. I like the bottom photo best. Wonderful spring feeling colors. Is that all Falkland? I feel like if I walked into your house right now I could just throw myself into any corner and be cushioned by clouds of fluffy wool. It’s kind of nice to think about! I love the colors that you used to dye these. 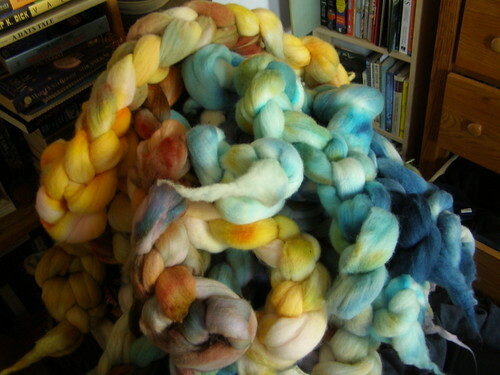 All that braided roving is making me want to dig up my spindle, too!